Fire up your engines and full burn out to the edge of the ‘Verse. 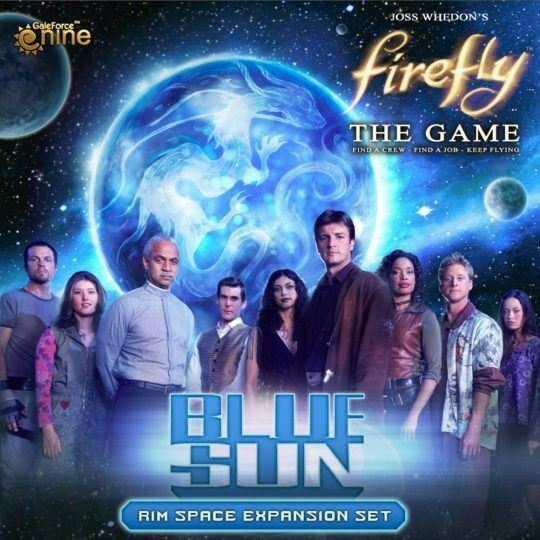 Firefly: The Game – Blue Sun expands the game with a new 10″ x 20″ map extension that adds new systems to explore and exploit in an area of space known as the Rim. Rim Space is not a place for the faint-hearted, and a ship pushing past Border Space out towards the raggedy edge of space had best be ready to deal with what’s out there. Navigate this frontier space with a new Nav Deck. A new Supply Planet offers new Gear to purchase and new Crew to hire. Two new Job Contacts offer new opportunities and unique game-changing challenges while the game’s other Contacts have new Jobs to claim a piece of the Rim for themselves. Two new Leaders present new strategies for players to execute as they focus on three new Story Cards. Two additional Reaver Cutters and new rules for these dangerous savages put the ‘Verse on high alert. Reaver activity is on the rise and your Crew is on the menu!